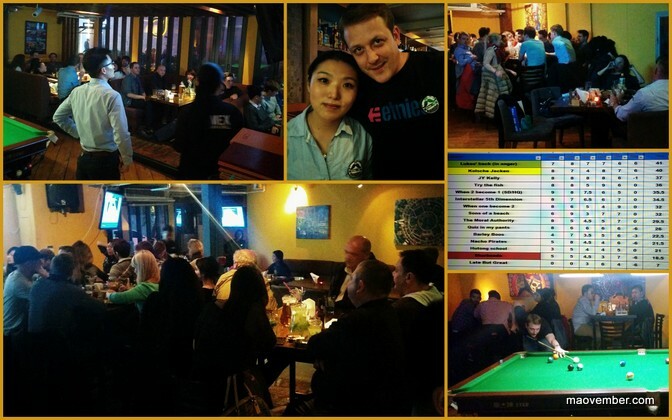 Sixteen teams joined last night’s quiz at Mexican bar and grill Q Mex and helped raise over 3500 yuan for maovember. Teams paid a suggested entry fee of 80 yuan, which got them a second pitcher of beer, and also chipped in via a lucky draw and sales of tequila picklebacks. Co-owner Stefan Schober also ran a pool tournament in which the loser of each game donated 100 yuan to maovember. By the time quiz masters Jay and Reece revealed the last answer — and the last pickleback was shot — Q Mex had raised 3781.9 yuan.